Android TV, including Sony, Sharp, LeEco, Mi Box, Nvidia Shield, is a name of TV operating system and a smart entertainment platform developed by Google. Users can remotely navigate apps, games, movies, music and TV shows. And it is also works like a Chromecast to stream content from your mobile device to the big screen. Android TV not only allows users to watch streaming videos from Netflix, YouTube, and etc, but also directly access the popular music streaming services like Spotify, Google Play Music, Pandora, and your local music files. But why Apple Music does not work on Andorid TV at all? No built-in Apple Music app on TV, and it sounds impossible to air the Apple Music contents from iPhone to Android TV, even there is no further information that Android TV will support Apple Music some day. 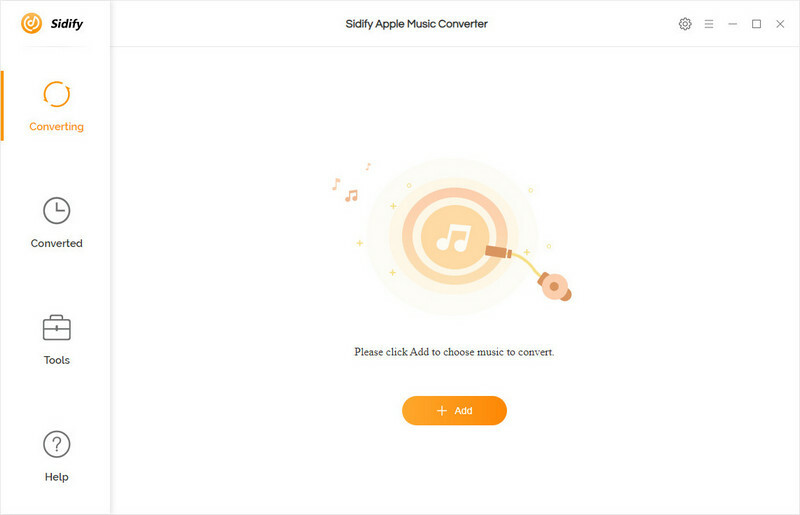 Now, a new solution comes to help you stream Apple Music songs on your Android smart TV, and Apple Music subscriber can follow this instruction to get Apple Music work on it. 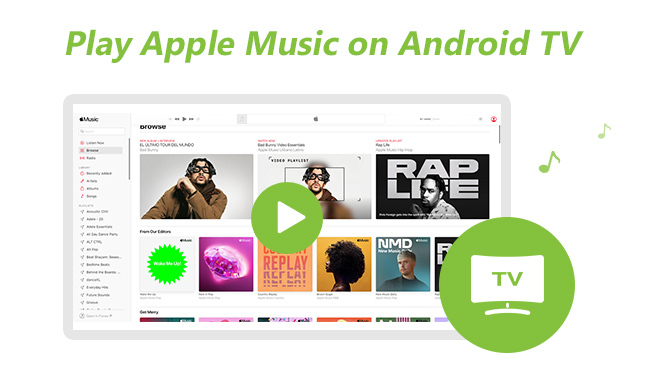 Why Apple Music Does not Work on Your Android TV? 1. There is no built-in Apple Music app supported by Anroid TV until now, and we have no idea this is possible in the future. 2. The contents you downloaded from Apple Music are DRM-protected, which blocks any possibility to stream Apple Music on other unauthorized devices, though you can air the contents to TV screen in the virtue of airscreen programs, the best solution is removing down the DRM protection to make Apple Music contents become you personal local files. 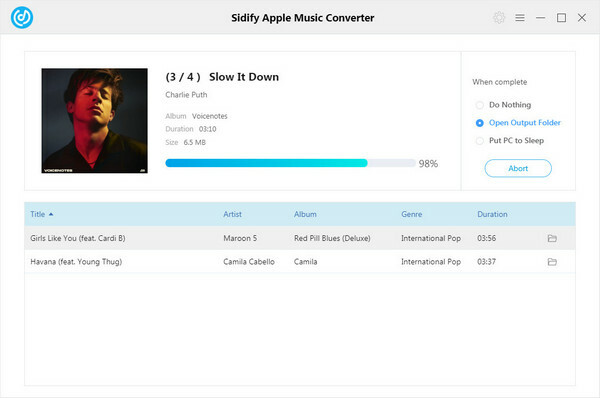 If you are waiting a more practical approach, Sidify Apple Music Converter comes to help Windows or Mac users to convert Apple Music songs to DRM-free audio files like MP3, AAC, WAV or FLAC, at the same time, 100% original audio quality and ID3 tags will be preserved. And this powerful Apple Music Converter also works for iTunes M4P music and iTunes M4A/M4B & Audible AA/AAX audiobooks. The following part will show you the simple steps on how to play Apple Music songs on your Android TV. 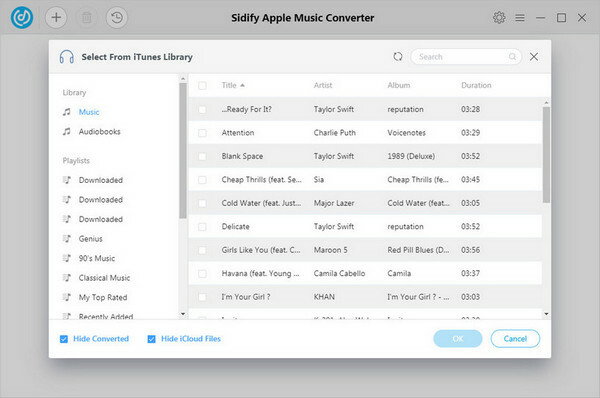 Click icon on the main interface of Sidify, then a window will pop up to show the list of your iTunes library and you can choose the Apple Music songs you want to convert from the list. After selecting Apple Music files, click "OK" to check. Click button to customize the output settings including output format, output quality, output path and conversion speed. If you want to get higher audio quality, you can choose FLAC as the output format, audio quality to 320 kbps. 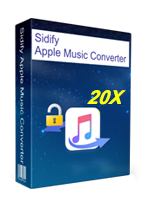 Sidify Apple Music Converter supports faster conversion speed, so here you can chose 20x as the conversion speed to convert your thousand of music catalogue in a cup of coffee time. 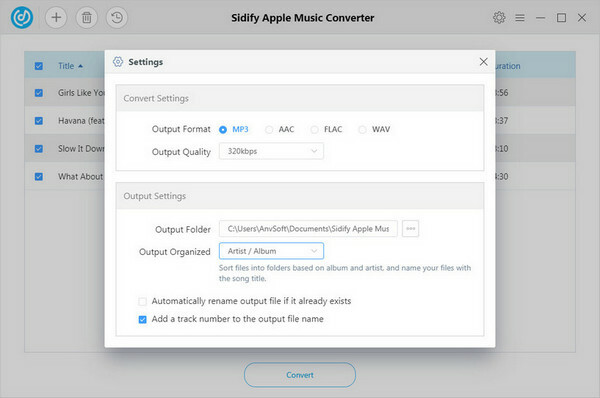 After customizing the output parameters, you can click Convert button to start converting your Apple Music songs to unprotected MP3 or FLAC audio files. After the conversion completed, you can click button to check the well converted Apple Music files. With the 4 simple steps above, you will get DRM-free Apple Music files, and now you can adopt a way you like to play the converted Apple Music songs on your Android TV. You can transfer the converted Apple Music to your USB drive. Just plug the USB drive to Android TV via USB cable. Then start to navigate the Apple Music and choose a music player for playback on you Andoird TV. Or you can upload the converted Apple Music songs to Google Play Music on your PC or Mac firstly, thus you can play Apple Music on Android TV directly. That is all, and you can lie down on your sofa and start playing your Apple Music on Android TV with remote control. Now, enjoy your leisure time!